Unfortunately, I purchased a fully loaded Escalera just before deciding to slow way down on the hobby. I can’t say I’m done, but I don’t think I need an Escalera at this point. My total cost was ~ $4000 after shipping, tax, etc. Larry was great to work with. 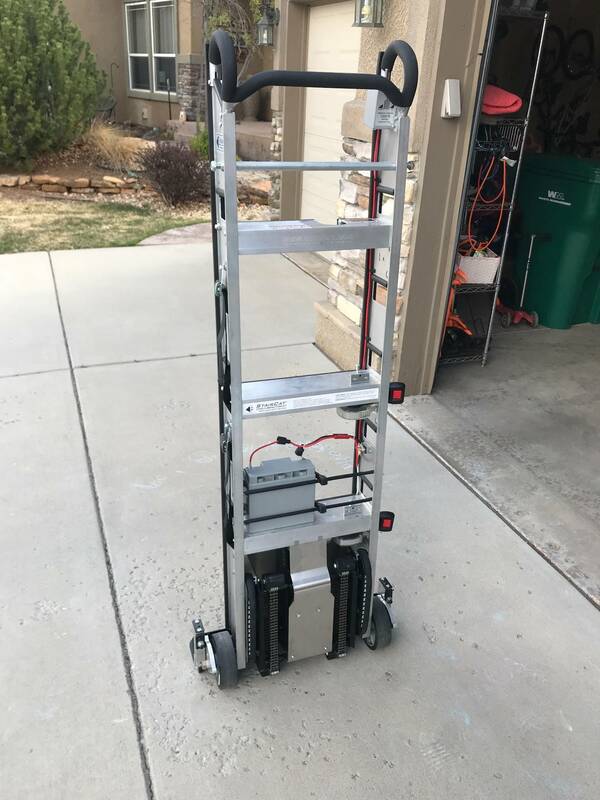 60” Stair-climbing handtruck with removable forklift. I’m still trying to get a breakdown of the individual costs of all the accessories. I am happy to show receipts. 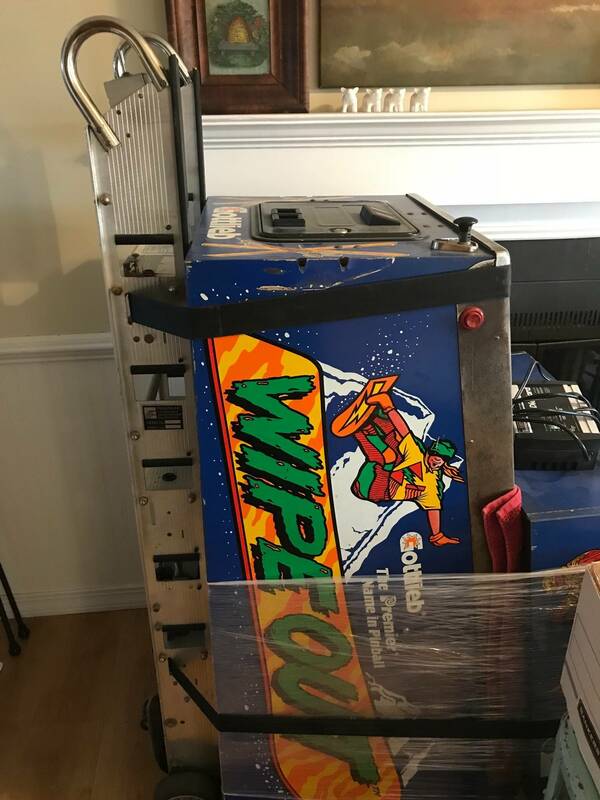 I’ve never moved even one game all the way up stairs with it. $3000 OBO for everything. Wow! That's the Rolls Royce of Escaleras you have there. Happy to part out, sell some of the accessories separately. Escaleras are pretty darn awesome, especially for weaklings like me who can't just manhandle things on their back jogging up the stairs. - STTNG as an example. Anyone who's had one, knows this is one heavy SOB of a game. I've personally got the midsize unit, with the forklift and pinball plate. Plus, the toe hitch. Zero regrets. You can use the forklift with the 60" Escalera? I was thinking the 66" was the smallest. And that is definitely some setup you have. The one I have has been great for moving machines, dressers, and plenty of other furniture. OK Escalera owners I need some advice. I have had the unit for about 2 weeks and I must be doing it wrong? Granted my first attempt was an Elephant Hobbit. Going up my stairs (many more than 3) it almost Lunges forward making it a holly crap moment. I tried using a lower angle and that was a Scary outcome as it ended up rolling down 3 stairs with me holding on for dear life. Tried less angle and back to lunging #400 lbs forward again. 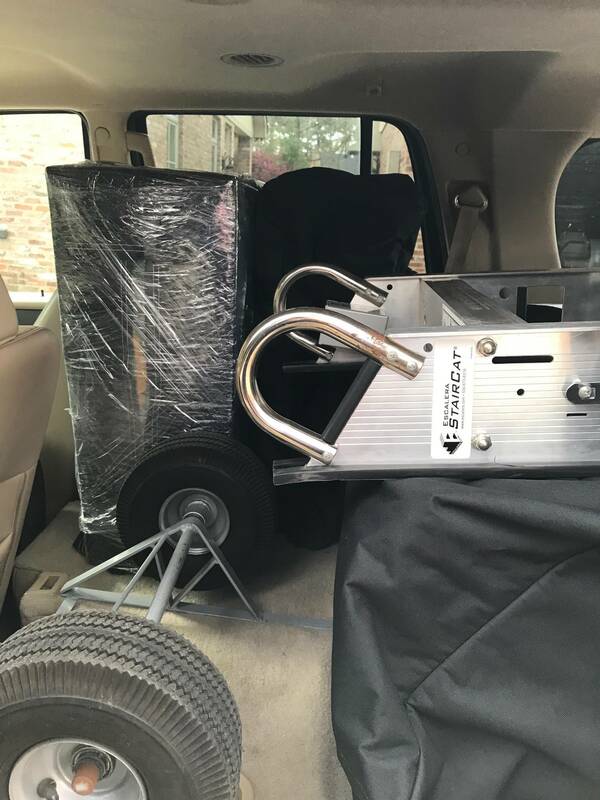 What am I missing as I really want this to work but it feels safer now with the old clean and jerk with the manual dolly. Any advice would be greatly appreciated. Possibly my stair treads are to small or tall? 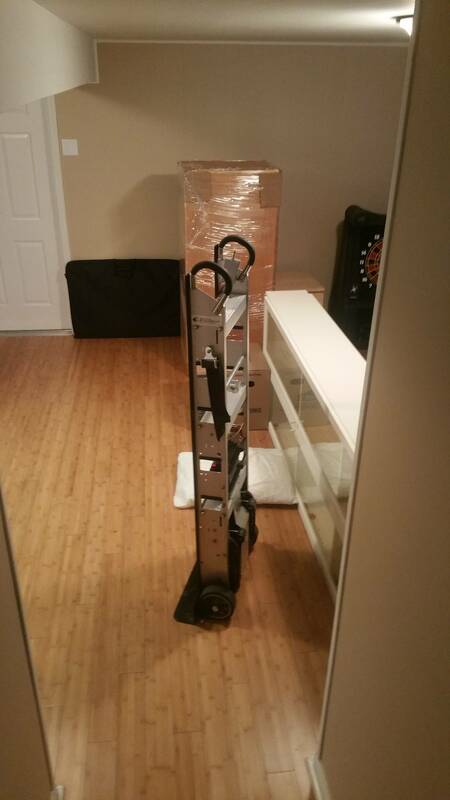 There is barely an inch for the lift roller to grab the end of each stair? That jerk you are feeling is the shift in the center of gravity when the load's weight goes from the main wheels to the small lift wheels. You need to anticipate it and re-balance the load once the shift happens. It's definitely a somewhat jarring feeling at first, but the whole process will become second nature after you've used your Escalera more. When I first started using mine, I found it easiest to activate the switch just a little at a time and go slowly until you start to feel the shift, then apply the necessary counter force and continue up/down the stair. Gweempose is correct it is the shift in the balance point from the wheels to the feet that have landed on the next step up. Try this until you get used to moving a game with the Escalera. As the feet go down to touch the step go very slowly until they just touch the next step. Push down on the handle to physically move the weight from the wheels to the feet. Now the game is on the next step so no change in the balance point. Repeat until you are up the stairs. Once you get used to this it will be second nature. 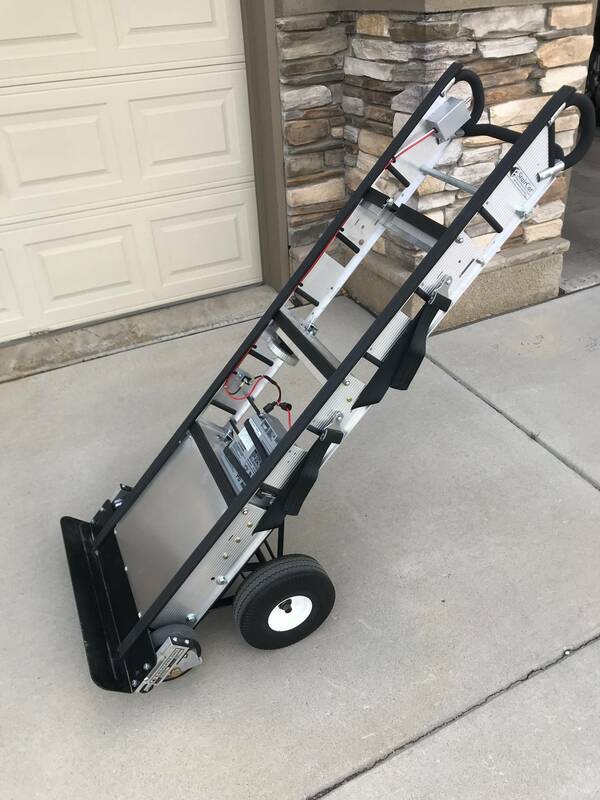 If you lower the game the belt on the hand truck will contact the edge of the stairs before the feet and allow it to slide down as with yelobird. So maintain the balance point at all times and it will be fine. Jellikit the middle size is the 66 inch. So the forklift option only goes on the 66 inch or a special order for a 72 inch. Where are you located, local buyers that wouldn't have to pay for shipping could save a lot of $$. These are my costs, I will discount everything by 20% on individual components, or everything for $3000 (25% off). I am in Colorado Springs. Great seller. Deal with confidence! GLWS Russell! Some Mexicans building houses for me just installed escalera. =$2028, call it $2000 even. They work pretty well for going upstairs, but going downstairs is always a bit scary. I have an escalera. The unit itself is pretty heavy. 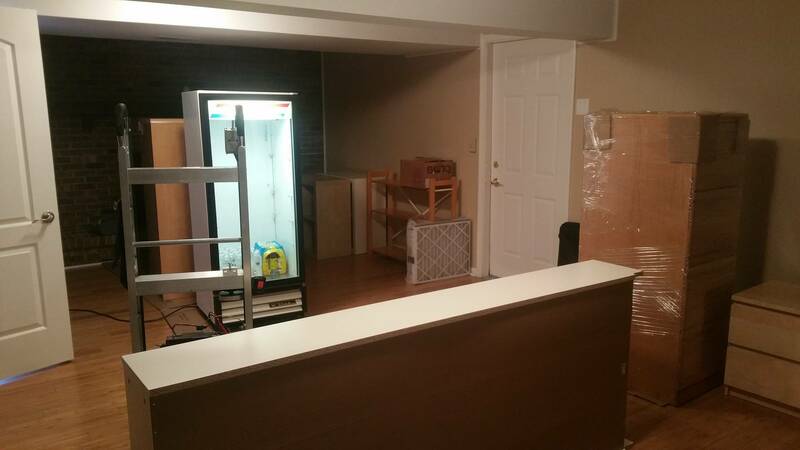 On the plus side, you can move a game from a basement by yourself, but it is a slow process. My advice is to Practice using it with nothing in it a few times going up and down stairs to get used to it. Just realized I had my location hidden. Fixed it. I’m in Colorado Springs, CO. I believe the stair edge detector kit is supposed to make the process of going down the stairs less frightening? In a way I'm glad this isn't closer to me or I'd probably already be on my way to pick it up, lol! bump for a great dude to deal with! I would agree to that if as shown in the video you have 2 foot deep stairs. For traditional pitch stairs I am certain this feature would be useless. Ehh... if your cart's wheels aren't hitting the landing of the step... you are doing it WAY wrong The machine rests on it's wheels inbetween each climb. These chocks would further help keep the base steady. I have the edge detectors on mine. They are a great feature and definitely help even on normal stairs. Has anyone used one on hardwood stair treads? Do the tread edges take a beating? I agree..... I found that the best way to go down steps is just to have my wife there also. She does NOT have to lift at all, she just keeps pressure towards the back of the step so the escalera does not roll forward going to the next. Easy and very safe when we do it this way. Going down is definitely a lot more scary than going up, since you're essentially doing it blind. 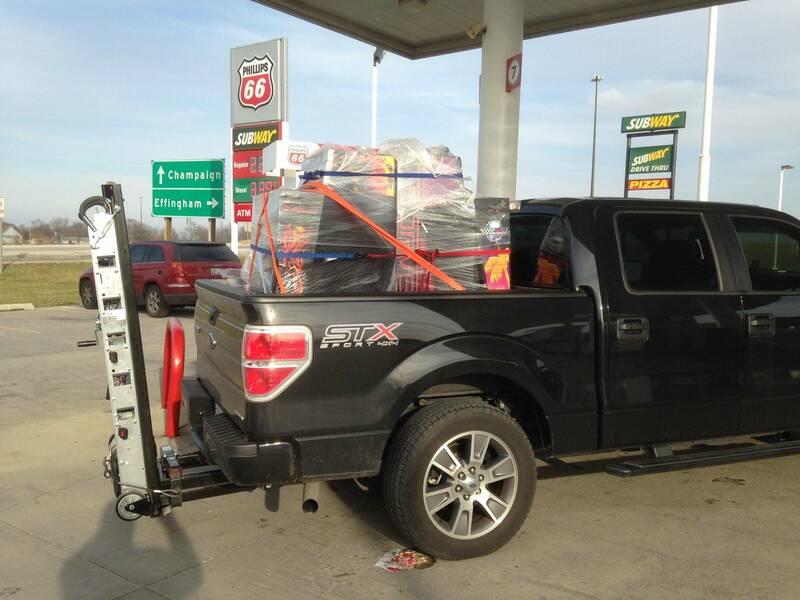 No problems up or down with the Lectro-truck. Never any issue with finished stair treads either. 600# gun safes are no issue at all. I have no problems going down or up. But I use it almost every day and have been for many years. 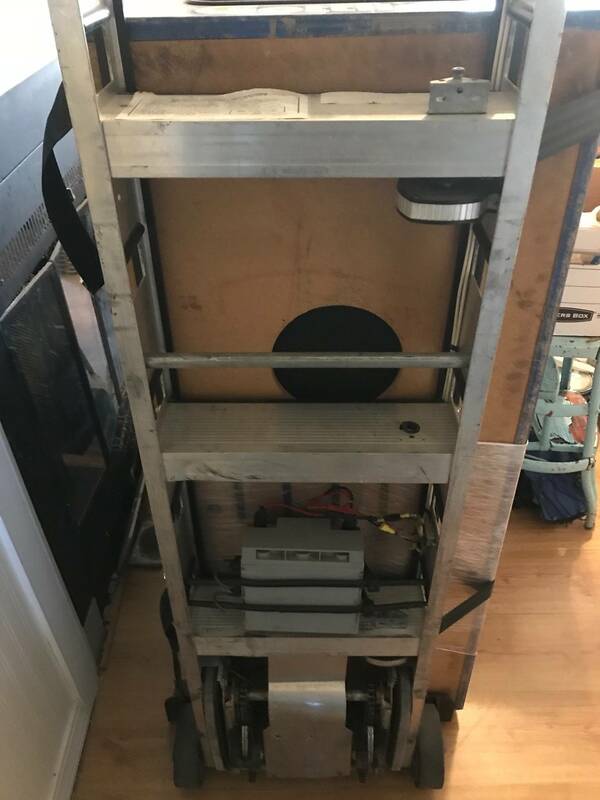 For folks who don't use an Escalera, or any other hand truck but occasionally, I can understand why it makes them nervous to see their game hanging over the edge of the steps. Used correctly one person can do it very safely. 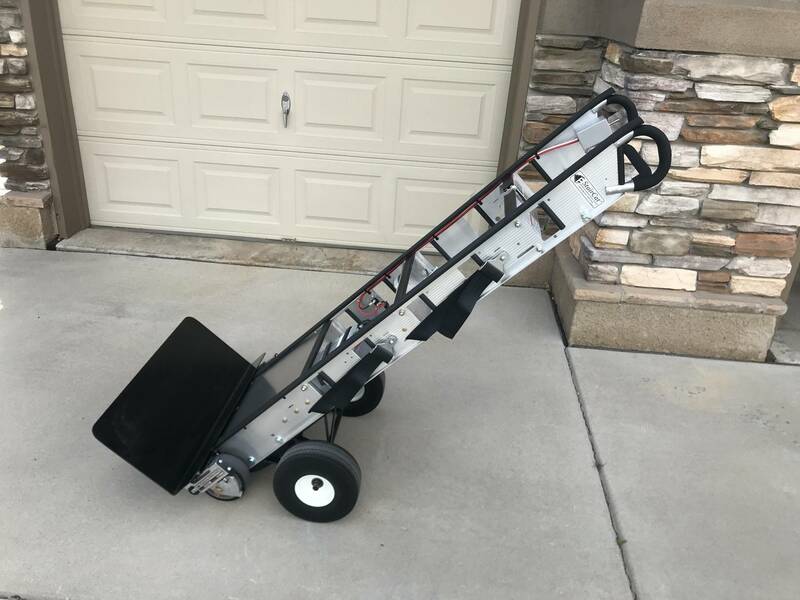 Base model Escalera is rated for 700# but the base models on some hand trucks are only rated for 600#. 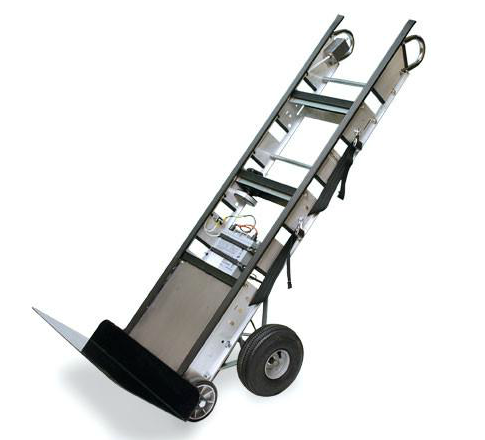 Other hand trucks can pin you against the wall at a landing since they must extend to lift over that last step. Escalera does not. The Escalera does not damage the edge of the stairs. 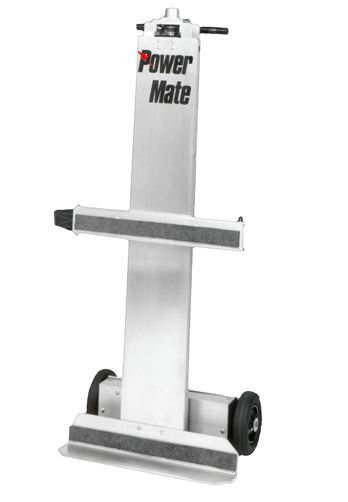 It lifts the wheels over the edge, just like many other powered hand trucks. 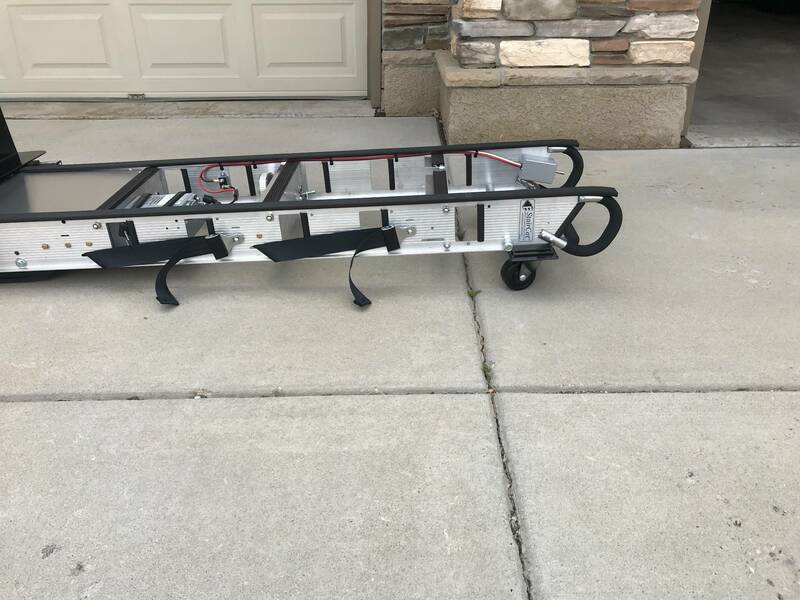 Appliance dollies or hand truck actually use the edge of the steps. The belt hits the edge and all the weight is applied to the belt as it rotates up to the next step. 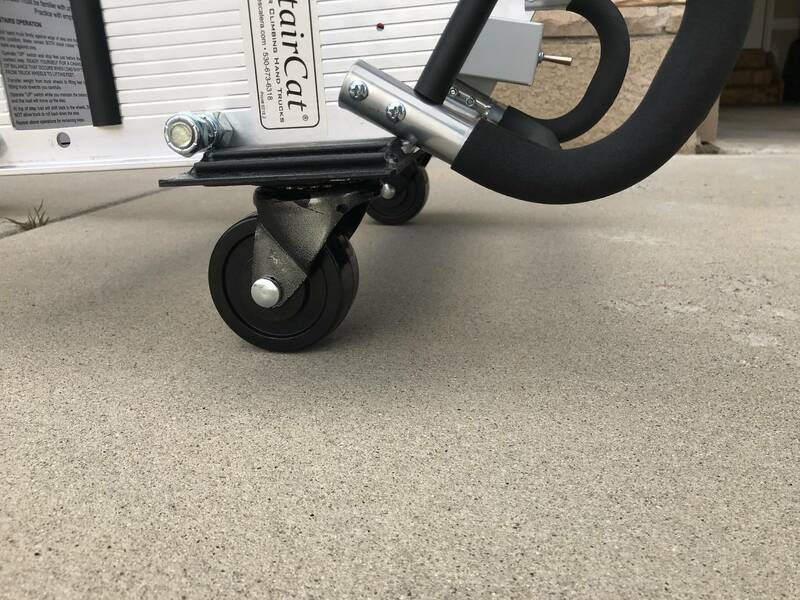 Watch videos on how it works and you can see exactly how the wheels clear the edge of the step. $2900 for everything. Ad posted on Craigslist, Pinside ad to follow soon. You sure that's a 66"? Looks like a 72". I could be really wrong. It would say on the serial number tag. It's 66". Can't find the serial number tag, where is it? It's not near as tall as me. So, not 72". Serial tag is on the side. 66” is the perfect size.